When going through my junk that was in the old table drawers, I found a stack of old Photos from many many years ago. This was such a coincidence for many different reasons. Picture 1 above was taken just last week, and is one of my first woodworking projects that I finished completely by myself. It was a cross that I gave to my mom when I was in the 8th grade to put in our front yard for the Lenten and Easter season. This was kind of ironic because there are no records of purchasing the lumber for this project, and there are some suspect stories and allegations regarding the origins of the lumber in question. I’m sure my neighbor’s homemade wooden tree stand suffered weather damage which resulted in those two pieces of wood going missing. ;-P Picture 2 is one that I just found again (circa 1998) and features 14 yr old me standing proudly in front of my build. Picture 3 is another one I found, and is probably my first project that I gifted to my dad. It was a lamp that was built from a piece of wood and a 1994 Penn State National Champions Pepsi can. My dad is a Penn State Alumnus, so that can had extra meaning for him. I’m not sure if I made that in 7th or 8th grade, but I can remember how nervous I was giving it to him on Christmas morning, not sure if he would like it or not. The last picture is of Angelo Santucci and my 11-year-old self, I believe from around 1994. Angelo was not only my grandfather, but the initial inspiration for my love of making. He would spend hours in his little 8’x6’ coal-cellar-converted-to-basement-workshop making nick-knacks and other things out of wood on his Craftsman scrollsaw an mini belt/disc sander. We would pick a pattern, he would cut it out, and then I would go upstairs and paint it with my grandmother. I still have a few wooden Stanley Cups we made after the Pens won it in ‘91 and again in ‘92. He was not only my first wood teacher, but also my fishing partner and a WWII survivor. We just celebrated the 23rd anniversary of his passing a few days ago on March 21. I still miss him lots, and occasionally tear up wishing that he could spend a day with me in my shop at school to see how the seeds he planted in my mind have grown to affect so many others. That’s one reason why woodworking is so uniquely special, not only to me, but to a lot of people. You don’t have to have fancy tools or expensive materials to make things. All you need is a little inspiration and can-do mentality. Also, its not always about the finished product, but the time you get to spend with other people that makes things special. So, if you read this, my suggestion is that you try to plan out a new project with someone special to you. It doesn’t have to be anything huge, but cherish the time that you get to spend with other. Thanks for looking and sticking it out through this jumbled mess of a post. Nice pictures and a neat story well told. We all have a story of some kind about our “woodworking”. I started by making propellers on sticks with a coffee can lid for the rudder that were put on top of fence posts around! the farm yard. A hole was drilled and then sometime I cut a .22 shell and made a bushing, usually not though. Then just nailed to the top of the post. https://s3.amazonaws.com/vs-lumberjocks.com/potwd22.jpg! I do not think I was even in first grade yet, when I started doing that. Someone obviously had shown me how; but, I have no idea who. Might have been my dad or one of my uncles; I know it was not my grandpa as neither did any woodwork. The picture is the drawknife, I always took without permission and was NEVER supposed to touch! I still have it and sometimes still use it roughing thins out. I have no idea when the handle was changed; it is as I remember first using it at least 65+ years ago now. I do not know how old that drawknife is either or even the brand. 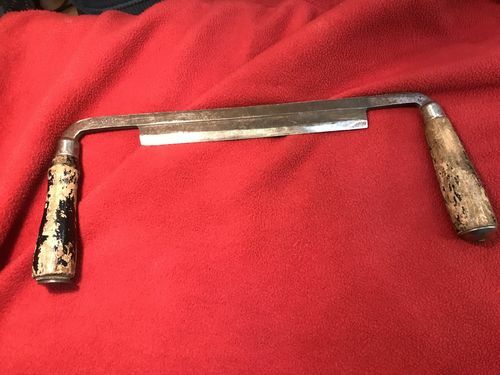 I found no markings on it, except a stamped in #8 and beside it my dad’s initials. Very nice memories, Mike, They are treasures! With 3 Grangirls no shortage of projects, # 2 picked up a piece of Purple Heart and said this would make a nice Box for Me! Have lost count of what has been built for my favorite Daughter? Have some very special boards in the shop that someday will be a Shadow Box in memory of my Dad, regret he never got to see some of the work he inspired in me. It’s a great story Mike. When we can go back and see who inspired us the most to do what we do is a blessing. Although inspired by many through my life I can still remember my dad having me in his shop helping out teaching me the basics. Great looking nightstand. I am sure your grandfather would be proud. A most excellent story, thanks for sharing. Nice story that brings back memories of my Dad and Grandpa. Thanks for sharing! Thanks for sharing your story. 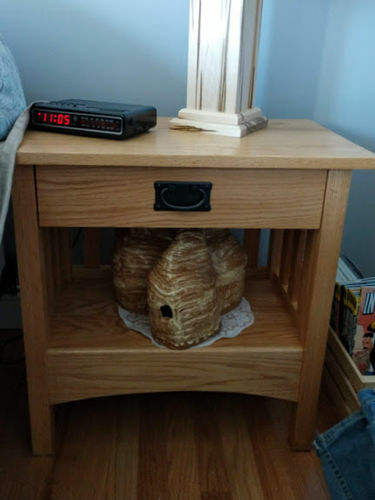 Building customized items for home has been part of my journey into woodworking. And then making projects that are gifts for family and friends. That is what keeps pulling me back into the shop. Plus, shop time is a good outlet separate from my professional life.